“Our Culture is being Seduced by Wolfish Leaders into a New Barbarism as the End-of-a-Cycle of Civilization” by Fr. George Rutler. The restoration of Grand Central Terminal took several laborious years. It was saved from demolition in reaction to the barbaric destruction of the grand Pennsylvania Station, an aesthetic tragedy paralleling the vandalism of liturgical renovators around the same time. The new and unloved Penn Station insults the aesthetic culture just as do many churches built in that period. The ceiling of Grand Central retains a small untouched patch to show the contrast with what it looked like before the cleaning. So too, we need an historical sense to appreciate the contrast between civilization before and after Christ changed the world. He contrasts the world redeemed and unredeemed in his imagery of the Good Shepherd who “lays down his life for his sheep” versus the wolf that “attacks and scatters the sheep.” The contrast is vivid again today, in the saints who follow the Good Shepherd and the evil people who terrorize humanity as wolves. 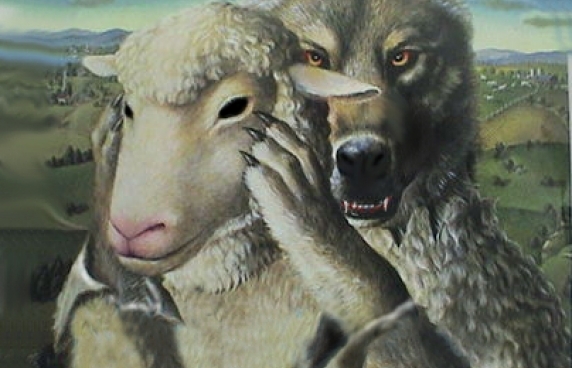 Wolves can fool the sheep, scattering and dividing them through flattery (Psalms 5:10; 78:36; Proverbs: 28:23, 29:5). It is significant that the same Apostle who justly boasted that he flattered no man (1 Thess. 2:5) warned against wolves who disguise themselves in sheep’s clothing by perverting the truth (Acts 20:28-31). Putting aside the tendency to nostalgia, there certainly is enough evidence to warrant a fear that our culture is being seduced by wolfish leaders into a new barbarism as the end of a cycle of civilization. The innovative philosopher of history, Giambattista Vico, described the pattern: “Men first feel necessity, then look for utility, next attend to comfort, still later amuse themselves with pleasure, thence grow dissolute in luxury, and finally go mad and waste their substance.” The new barbarism would be worse than the old, in the words of Churchill in 1940: “. . . a new Dark Age, made more sinister, and perhaps more protracted, by the lights of perverted science.” He also warned that the worst enablers of social vandalism are not wolves in sheep’s clothing, but sheep in sheep’s clothing. Ignorant of the difference between sin and virtue, they naively “waste their substance” and welcome wolves while deaf to the voice of the Good Shepherd. Fr. George W. Rutler in persona Christi reveals true insights and foresights of a Good Shepherd concerned over the welfare of his flock’s souls. Such good news and good fruits can only come from good trees.